Bob and Helen try to lead a civilian life, chucking their former identities- Mr. Incredible and Elastigirl- because of the government’s non-cooperation. They have three kids- Violet, Dash and Jack-Jack. Being the children of superheroes the kids also have super powers. Dash can run really really fast, and Violet can vanish and also create magnetic fields. But, the children are asked not to use their super powers, and lead a normal life. Everything goes well until one day when Mr. Incredible gets an invitation to destroy a robot called Omnidroid. The man accepts the job immediately, waiting to use his superpowers. He lies to his wife and children about the mission, and goes on with it. But there, he gets into trouble. Helen finds out when Mr. Incredible gets into a fix, and becomes Elastigirl to go and help him out. On her way, she finds that Dash and Violet have also accompanied her without her knowledge. They all go and try to help out Bob- with their superpowers. Syndrome, the villain, locks them up in the abandoned island, and goes to the city to prove himself to be the real hero. 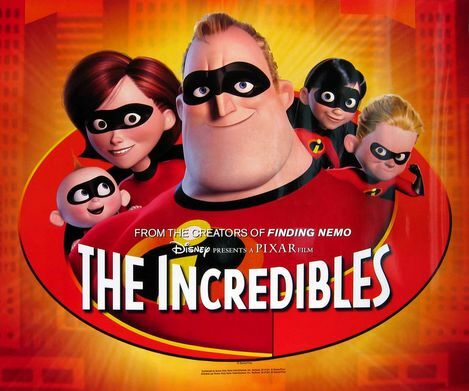 The Incredibles escape, go to the city in a rocket and save the day from evil Syndrome. When Syndrome tries to capture the young baby Jack-Jack, they all look helplessly. But Jack-Jack proves himself to be the son of superheroes as he exhibits his fire and form changing power(even as an infant) to escape from Syndrome. Syndrome gets defeated. All ends happily, and the Incredibles settle for their normal life. The family decides to become superheroes and save the city when trouble comes again! I loved the infant Jack-Jack! He was so cute and lovely. The climax was awesome! I liked the movie very much. It simply has unforgettable characters!